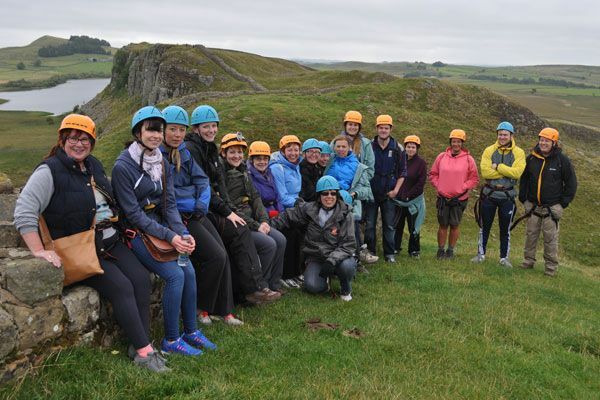 LLOYDS BANK colleagues overcame any fear of heights they had by abseiling down Hadrian’s Wall in aid of Calvert Trust Kielder. 20 brave members of staff, including managers, cashiers and financial advisors from branches across Tyne & Wear, completed the 35 metre abseil, organised a fundraising evening and also collected donations from Lloyds customers to raise a fantastic £10,000 for the charity which helps disabled people enjoy outdoor activities at the centre in Kielder. Lloyds Bank manager, Wendy Brady organised and took part in the abseil and said she was very proud of her team and colleagues. “It was really quite scary at the beginning. But once I got started I loved it and I’m very, very proud of myself and all of my Tyne and Wear Lloyds Bank colleagues who completed the abseil. After completing the abseil Lloyds staff visited Calvert Trust Kielder to tour the site and facilities to see for themselves the activities and ongoing work their donation would be funding. Corporate and events fundraiser at Calvert Trust Kielder Hazel Ditchburn supported the team on the day. She said: "This was a great fundraising event and definitely no mean feat so the Lloyds staff should be rightly proud of their efforts. “Most importantly, the Lloyds team who gave up their time and challenged themselves have raised a whopping £10,000 which will make a huge difference to everyone we help. "We are very grateful to all of the local and regional businesses, organisations and individuals that continue to support us, our fundraising and our work with disabled adults and children." The next big fundraiser for Calvert Trust Kielder is Kielder Quest, a corporate team challenge taking place on 3-4 March 2016. For further information visit www.calvert-trust.org.uk/kielderquest or call the fundraising team on 01434 250232.